With sluggish economic growth, students demanding free education and low revenue collection, there might be significant tax increase in the pipeline next year as South Africa faces multiple unknowns. The Finance Minister Pravin Gordhan said during his Medium-Term Budget Policy Statement that the government’s objective is to achieve inclusive economic growth in South Africa and told the public that the ailing economy can be restored if all sectors collaborate. According to the finance minister, if the government does not collect and generate revenue for the economy, there will be a hit on both taxes and expenditure. Despite the constraints, the medium-term budget policy statement tabled on Wednesday 26th October has allocated a massive R17.6 billion more than projected for post school education and training over three years, in addition to the R16 billion added in February. The money will be used to subsidise the fee increase for poor households. The policy statement – SA’s 20th has also signaled straitened times for government departments, which will be required to cut back on their spending, particularly on employees. Despite all difficulties, Gordhan stressed to MPs that South Africa was not in a “hopeless” situation, as it created a situation of policy certainty and economic stability for investors. Fees Must Fall… Are protesting students getting closer to their free education? The demand for free higher education has persisted, and chaos has erupted at campuses across the country as police have clashed with protesting students. Addressing the #FeesMustFall protests and students demanding free education, the Treasury plans to increase university subsidies at an annual average rate on 10.9% and its allocations to the National Student Financial Aid Scheme (NSFAS) by 18.5%. NSFAS will be allocated R2.4 billion. The government will fund the increase in fees at higher learning institutions for 2017 with a maximum of 8% for students from households earning up to R600, 000 a year, which is expected to cost R2.6 billion. Speaking alongside Gordhan at a press conference on Wednesday, the Minister of Higher Education, Blade Nzimande, said that he was happy about the allocations the treasury had signaled. He furthermore said the college sector needed to be up to four times larger than the university sector. Economy expected to grow by 0.5% for 2016, down from the 0.9% estimated in February. Budget deficit will decline from the current 3.4% to 2.5 in 2020. 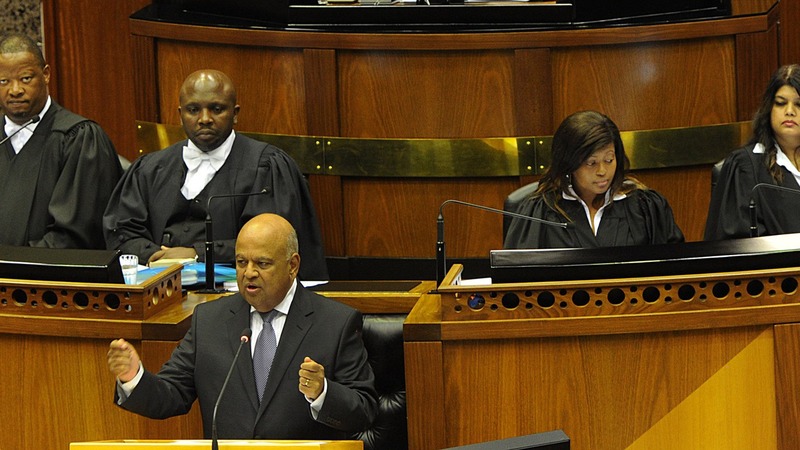 Gordhan proposes raising an additional R43 billion rand through tax measures over the next two years, R28 billion of which will be in the coming financial year. Government predicts there will be R23 billion less revenue than what was initially forecast in the 2016 Budget Speech in February. The expenditure ceiling will be lowered by R26 billion. An additional increase of R10 a month has been made to the social grants with effect from October. Additional allocations for tertiary education, healthcare services and social protection. There is a further R9 billion proposes for the National Student Financial Aid Scheme (NSFAS) over the period ahead (an additional 18% a year). The Medium-Term budget policy is tailored for economic environment that is “a challenging one, but not an impossible one”. The unknowns are endless. Will economic growth pick up or slow down? Is a credit rating downgrade forthcoming in December and, if it happens, how will it affect the South African economy? What unexpected demands might come forward, placing further pressure on tax payers? And will Gordhan be delivering the budget speech in February next year? These are some of the questions on people’s lips.